I've taken some time to round up the items that are most popular with my crew right now and put them all in one place for you. 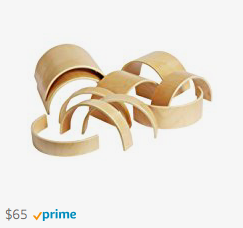 And, to make life easier, it can all be found on Amazon!! Strider Bike// This is Sloane's absolute favorite. Jungle Jumparoo// Fan favorite for all of the neighborhood kids. Whittling Knife// Spring winds are dropping lots of branches that are perfect for carving. Swimmy // This is one of my favorites from childhood. Frederick // Another childhood favorite of mine that all three kids adore. Frog and Toad // We love reading this in the playroom or before bed. Four stories in one! The Good Little Bad Little Pig // This is SUCH a great book. Do you know it? When Sophie Gets Angry // I am always keeping this one handy. Sometimes You Get What you Want // A lesser know book that is a GEM. Grimm’s Sticks // I get so many questions about these sticks! Marbles // If you know us, you know these are in constant use! I think the kids are up to 160. Animals // My youngest is animal obsessed now. Magnatiles // I rearranged how we store these and it brought a new life into them! Play Silks // I changed these by putting them in a crate instead of hanging and now we can't get enough! Liquid Water Colors // These florescent ones are the best!! Water Color Holder // Beautiful and so well-made. Color Burst Sharpies // For layering on our water colors. Chalk // The kids have been crushing chalk to make paint. Mallet // For crushing chalk not fingers. Drop Cloth // My favorite absorbent canvas. These are affiliate links, which means a get a tiny kickback when you purchase from my list. It does not cost you anything. Thank you for supporting The Workspace for Children. A really beautiful thing happened to me the other day. A neighbor rang my doorbell and complimented me on a job well done. She went on to tell me about a time that Nate hopped off his bike while he was riding with friends and helped her carry her groceries to her front door. She told me about another time that she looked outside on a snowy day and Ruby was shoveling her front walk. The neighbor offered her money, but Ruby declined. My girl explained that she was just trying to help. I was so moved by this information. It felt important. Yesterday, I asked my ten-year-old, "Why do you think you chose to become a helper?" He gave me a really weird look so I explained the premise of this blog entry. I told him that my heart was full and I wanted to understand more about his thinking so that I could share it with others. Then I asked him again, "Nate, seriously, what is it that makes you choose to be a helper over and over again?" "IT FEELS GOOD TO HELP," he said. Yes, it does, my sweet boy. Yes, it does. If I can raise my children to be anything, I want to raise them to be helpers. Helping someone else ALWAYS yields happiness, and that's what we are really looking for, right? At the end of the day, I think we all wish that our children are happy. Here is how I am supporting my children in becoming helpers. 1. Model. This is kind of obvious, but when I see someone who needs help, I help. I try to help every time I am able. I especially help when I am out and about with my children. At the grocery store, we offer to lift bags for older people or moms who have full hands. At the beach, it means helping strangers haul their kayak or lug their beach chairs. On the streets of NYC, it often means buying a hot dog or a warm drink for the homeless person on the corner and modeling how to look a person in the eye when offering to help. 2. Teach Meaningful Skills. From when they were very small, the children worked side-by-side with my husband as he tirelessly raked leaves or shoveled the driveway. They loaded the washing machine with me and learned how to work the buttons. On the beach, it was their responsibility to carry something from the car to the shore, even if in the moment, it would've been easier to just do it myself. We taught them that their help was necessary. Their participation was integral to making things run smoothly for our family. Now they know what it means to help. They know how it feels to help. They have the confidence in themselves to do a job well, which makes them feel good and helpful. 3. Set Expectations. I expect my children to be helpers. I expect them to offer to hold the door for a friend. I expect them to pick up garbage when it is on the trail in the forest. I expect that helping others is just a part of who we are as people. It's not an extra thing that we happened to do on a particular day, it a part of who we are. If they forget, I remind them. I try to do it with grace, and not to judge, but I will always remind them to be helpful where they can. 4. Emphasize Feelings. Finally and most importantly, I try to catch them being kind in ways that are small and big. When I do, I emphasize the feelings they helped create and not the specific task that they completed. For example, you might hear me saying, "Ruby, Maria looked so relieved when offered her the extra water bottle that you brought. I think she was worried about forgetting hers and you really helped her feel better." OR, "Nate, Sonya was so stressed when she was trying to pick up all of the spilled crackers and stop her toddler from running away. She was able to keep her baby out of the street while you picked up the mess he made. " OR "Sloane, you helped Eloise feel brave when you held her hand as you walked in the door." Obviously, they don't help all the time and neither do I. There are times when they/we are in a bad mood or distracted or have our own hands full. That's perfectly okay with me. We are all human. But, because the kids know what it feels like to truly be a helper, to feel that really warm, good feeling when you just know you've made a difference to someone else, I think they will want to be helpers for a long time to come. At least, I really hope so. How do you raise helpers? I would love to learn more from you about supporting my children in becoming contributing members of society and spreading joy. As always, thank you for reading along and following our journey. These are our favorite light table materials. You can click on each photo and it will take you to amazon to purchase! These are affiliate links, which means that I get a tiny kickback from Amazon, but it does not cost you anything. I will add to this page as I discover and try more materials. 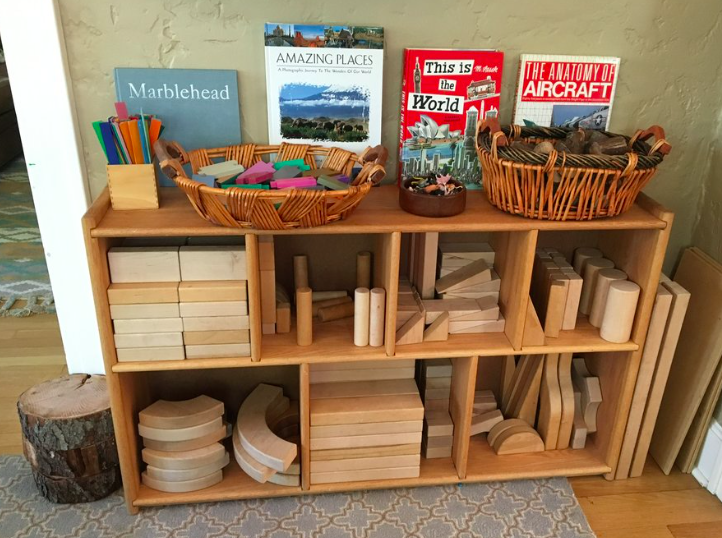 These are our favorite materials for our family playroom. If you want to shop these materials, please click on each photo and it will take you to amazon to purchase. These are affiliate links, which means that I get a tiny kickback from Amazon, but it does not cost you anything. We are kicking off Valentine's Day (month) with a fantastic giveaway and three simple ways to spread love and kindness within your own community this month. I've teamed up with Primary, Ooly, and Smarties Candy to bring you easy, fun activities to do as a family this month. Make sure to head over to my Instagram Feed to for a chance to win a mega-prize from these three brnads! I invited the children to think of a person in our community (school, neighborhood, town) that could use a little kindness this month. We had a meaningful discussion about who might need a little extra kindness and why. I was so happy to hear my older two children (8 and 10) talk to one another about people in their schools who are so helpful, but rarely get thanked or recognized. They talked for a while about who they would each choose. Nate decided on his school art teacher and the P.E. teacher. Ruby decided to make a card for everyone on our street because she thinks everyone contributes to all the fun we have playing outside together. My little one (4) didn’t really grasp the concept, but she delighted in making Valentine cards for her friends! When the cards were complete, Ruby loved sneaking her cards into mailboxes up and down our street. Later in the week, we made Valentine Cookies. In an effort to keep things very simple, I purchased premade cookie dough (no shame in my baking game) and baked some heart shaped cookies while the kids were at school. I colored some white, store-bought frosting with food coloring and set out some little Valentine candies. This activity was about gathering to make something for friends and neighbors, and I didn't want to burn myself out by making cookies from scratch, or by baking with the kids. I like to remake everything and have it ready to go because simple activities make for a more relaxed experience. The children arrived home from school to find the table set with frosting cookies and candies. They were ecstatic! They chomped on cookies, decorated some, and chatted about their day. When our cookies were ready to go, we popped them on some festive trays , bundled up, and the children rang doorbells and passed out cookies to brighten the day of our neighbors. It was REALLY fun! It was also REALLY easy. Next up? We left messages of kindness and LOVE in the form of candy... Smarties Candy!! The lovely folks over at Smarties gave us tons of beautiful Valentine candy to leave on doorsteps, in mailboxes and on windshields all over town. The kids had an awesome time munching on Smarties and writing little messages. The best part? Sneaking around leaving treats. As they fell asleep last night, they were all giggles as they thought about how people felt when they discovered candies on their windshields. There you have it, three easy ways to celebrate Valentine's Day while spending time together and brightening the days of those in your community. How will your family celebrate this year? This post was sponsored by Primary, Ooly and Smarties. All thoughts and opinions are my own. Thank you for following along. Don't forget to hop over to Instagram to win some great goodies!! Can you believe its almost Valentine's Day? I know, a Hallmark Holiday and all....but, it's my favorite!! As a mom, it's a no-pressure, happy celebration. There are so many easy ways to enjoy the holiday with your kids. Are you still reeling from the Winter Holiday bills like we are? If you are, rest assured, Valentine's Day doesn't need to cost you an arm and a leg. I plan to share a few Valentine Ideas here on my blog over the next few weeks, so stay tuned over here! This morning, I whipped two a quick, no-cook batches of Valentine Playdough and threw together some loose parts for an easy invitation to play. Typically, I favor cooked playdough. It lasts longer and the texture suits me better. But, being flu-season and all, I don't let our playdough kick around for a long time (germy fingers and all). The other reason I made no-cook dough for this activity, is because it is easier to make with your children. You can check out the recipe I used at The Artful Parent. Jean also does a great comparison of cooked vs. no-cook dough in this post. For a playdough aficionado like me, this information was top-notch! Check it out. I adapted Jean's recipe (linked above) by adding some cupcake scented oil. If you want some scent, I linked it right HERE. For our set up, I used an old tinker tray and fillled it with various Valentine loose parts. I am not even going to link the parts because I encourage you to get them from the dollar bin at Target or from your local Dollar Store. Like I said earlier, you do not need to spend a substantial amount of money for this activity. I know how tempting it can be to just pay up a bit and use Amazon Prime (guilty), but for this activity, I'm telling you... Dollar Store. And if you don't feel like making the effort to make the playdough yourself, give yourself a pass and just grab that at the Dollar Store too. The kids will be just as engaged and happy. Link for a tinker tray is HERE. Do you ever feel like your child wants a snack EVERY SINGLE SECOND? Are you constantly shopping for, prepping and then serving/ cleaning up snack? I have some tips to help out. While I can’t claim to solve all of the snacking woes, I can show you how we organize our snacks to make eating them a bit of a more independent endeavor. 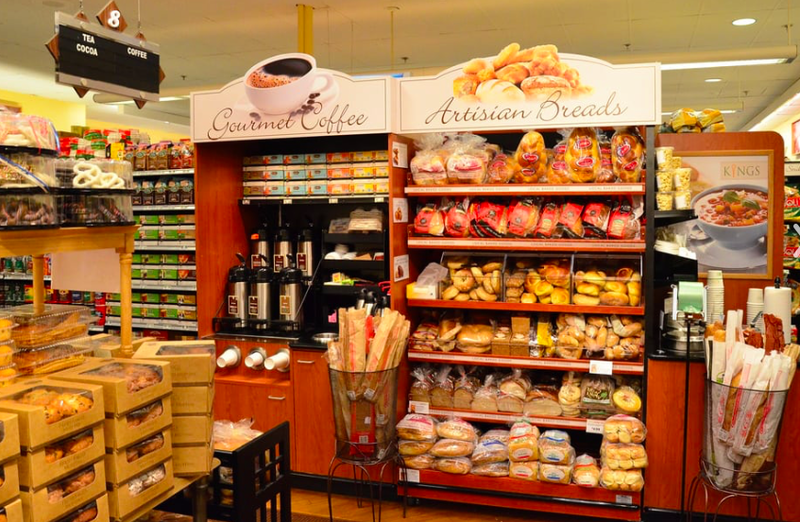 Meet… our self-serve snack cabinet. If you’ve been following along with me for a while, you know our family has an open-ended art cabinet. But did you know we have a snack one too?! Snacks can be tricky. I know a lot of parents who struggle with them- the negotiating, the preparing, cleaning up, and then doing it all over again. One way we battle this is with this self-serve station. In our snack cabinet, you will find a variety of shelf-stable foods that lean towards health (no candy) but aren’t strictly health food. Usually there are pretzels, popcorn, nuts, fruit pouches, snack bars, seaweed packs, olives, and dried or dehydrated fruits. I also keep mini water bottles, or a small pitcher of water and cups. I also store scissors and a marker in there. Why? The scissors are so that they can open everything themselves. The marker is to write their initial on their disposable water bottle so that they can refill it all day without taking another one. Also helpful when playdates are happening. We almost always have a variety of washed and cut fruit and vegetables in the fridge. My children are mostly healthy eaters, and they enjoy raw veggies and fruit. If that is available, they will almost always grab what’s in the fridge before heading into the snack cabinet. The snack cabinet is most in demand during the afterschool hours. On most days, I prepare a tray of fresh snacks for when the kids get home ravenous from school. I’ll put cheese, crackers, fruit, veggies and some sort of dip out. They chomp on that and then grab a snack from the snack-cabinet. A lot of people ask me how I keep the kids from eating everything at once, or how to limit it. The truth is, I don’t. I have always come at it from the place that if you are hungry, you should listen to your body and eat. If you are thirsty, you should drink (unless we are on a long car trip in which case I am CRAZY and don’t let them drink a thing! Another story for another post). I buy healthy-ish snacks that I feel are appropriate an I trust my kids to eat what their body needs. I don’t buy candy and junk food that I would need to put limits on. If I do buy junk food, it doesn't go in the self-serve snack cabinet. Of course, I do not want the children digging into the snack cabinet ten minutes prior to putting dinner on the table, or right before we are about to eat lunch. For the most part, they know that. If they forget, I will remind them. When I don’t want them snacking I will say, “The snack cabinet is CLOSED right now. It’s almost dinner!”. Sure, I get groans and annoyed responses, I’m okay with that. My four-year-old is another story. She has to ask before going into the cabinet. I like to have a conversation with her about whether we are close to a meal-time and whether she has had enough fresh snacks that day. It is less of a negotiation and more of an honest conversation. Once we decide that the snack cabinet is “open” for her, she is free to choose whatever she would like. Because we have a self-serve snack cabinet, I almost never hear, “Mom, I need a snack.”They already know where to go and what to do. For reference, my oldest child is ten, followed by an eight-year-old and almost five-year-old. We have had the snack cabinet in use since my oldest was just three years old. Do you have questions about our snack cabinet? Leave them in the comments below and I will answer you. Thank you for following along with me. Don't forget to join the conversation on Instagram. SO MANY TOYS! Instead of toys, how about giving the children in your life the gift of creativity? Here are some ideas for you. * I've written this post in collaboration with Discount School Supply. I have been a customer of theirs since my oldest was born and he is ten! Actually, now that I think about it, I have been shopping at Discount School Supply even longer than that. As an early childhood educator, I loved getting the DSS catalog and circling all of the materials I wanted for my classroom. I always know that I will recieve a high quality product at a fair price when I shop with Discount School Supply, so I am thrilled to share these supplies with you here. You can use this post as a gift guide or just a resource for what supplies to have on hand at home. These materials are great for all ages and can be used time and time again. ROLL PAPER /This paper is everything. If you know me, you know I am OBSESSED with roll paper. It was so useful when my children were tots and it still is now. I cover our tables in this paper almost always. It serves as a way to protect the surface, but it is also an open invitation to create. For young children, I roll it out on the floor, tape it down and hand them a washable marker (or paint, or stickers, or crayons, etc). That huge white space and the invitation to create on it is so impactful, no matter how old you are. These days, I cover our dining room table with this paper. It offers a beautiful canvas for my children to come and go and create together. On any given day, you will find our tabletop canvas covered in art and all three of my children creating together. TEMPERA CAKES /Tempera cakes are a wonderful way to use paint when you don’t want a huge cleanup. The colors are bold and they don’t get all over the place. These sets last FOREVER. If you need Brushes and paper to go with the paint, I recommend THIS and THIS. PUTTY / I love this Putty. It comes in wrapped packages so it's easy to portion out and you don’t have to worry about it drying out before you create with it. My kids are always asking for more of this. After the children create with it, it dries beautifully and can be painted. CONTACT PAPER /This stuff is SO versatile. I love using contact paper for collage. It takes out the “glue” step and allows your child to focus solely on the collage materials. Plus, there is very little clean up for you. All you have to do is peel off the backing, tape the contact paper down to your surface with the sticky side UP, and give your child some materials to stick on. You could use magazine scraps, torn paper, leaves, or anything else your little one can come up with. Bonus? If you tape it to the window, the sun shines through. You can learn more about how we use contact paper by clicking HERE. DOT MARKERS/ These are an art-cabinet staple for us. Children LOVE these. Small children love the up and down motion of stamping and the ink is right inside! Older children can get very creative making patterns and whole masterpieces all with dots. A great way to challenge the big kids. See some of the ways we've used them by clicking HERE and HERE. STICKERS/ I did a post a long time ago on our love of these stickers. You can read that post by clicking HERE. For little children these stickers are the easiest to peel and stick. If they are frustrated, peel the sticker for them and stick it on the edge of a little plastic container. It makes using stickers easier and more inviting. I also love that these stickers are open ended and not defined for them. Look how my 7 year old used them HERE. Markers/ I’m a bit old school in this regard, but these are my absolute favorite markers for all children. They are washable, bold and can draw broad strokes or detailed lines. They are also consistently inexpensive for such a high quality product. I tend to buy these in bulk and keep a back up stock. I replace them as soon as someone has colored too hard or the tip has been destroyed by an overzealous creator. There is something about a fresh set of Crayola markers that gets me every single time. No bells and whistles, just straight up markers. By the way, a pack of these markers and some good paper is one of my go-to gifts to give as a big brother/ big sister gift. CHALK/ This is a GREAT value. We go through so much chalk because there are an infinite amout of ways to use it! We keep a bucket of colored chalk on our front stoop so that anytime the children are playing out front, there is an open invitation to make their mark. A few times, we’ve even done THIS! STAMPS/ These are open ended and can be used in so many ways. They will be used by children for many years. For the very young child, I would put out only one or two stamps and one ink pad and a very big sheet of roll-paper. As children get older and more experienced you can offer more. 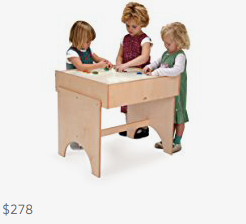 They can be used for patterning, shape recognition, and for open-ended art experoences. 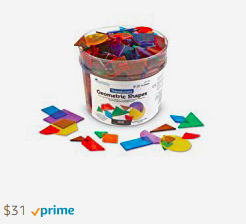 (They also double as great playdough tools). STAMP PADS/ I love these because you can put out as many or as few colors as you like. For younger children, I put out just one color while they experiment with learning the technique it takes to stamp color on the page. As the children become more experienced, you can add colors and talk about wiping the stamps between colors. These ink pads last a long time and don’t dry out if you take care of them properly. Do you want to give your family gifts that they will actually use? So do I. These are some of our tried and true favorites. Click to shop. Bibbed Rain Pants from one of our favorite shops, Biddle and Bop Kids. If you follow me on IG, you know my kids are wearing these ALL. THE. TIME. Victorinox Swiss Army Fieldmaster Pocket Knife My 8 and 10-year-olds have this and they use it all the time in the woods, at the beach, and at home. Savage Seeds T-shirts Stylish, soft, and with great sentiment. Gathre Mat We worked with Gathre back in June and tried out this beautiful, bonded leather mat. It quickly became one of our most-used items. Its so beautiful and functional. These mats make a great gift for moms, new and old. 9oz Swell Bottle These bottles never leak, keep hot stuff hot and cold stuff cold. We love to use ours for hot chocolate in the snow during the winter. OmieLife Lunch Box These are the lunch boxes my children use every day. They have an option to pack hot or cold. They are super durable and fit inside a standard lunch box. Micro Mini Deluxe Kick Scooter We never travel without these. They come apart easily to fit in your suitcase! They make great options for tots through adults. Bogs Kids Classic High Winter Snow Boot These are the boots you'll see my children, my husband and I sporting this winter. They are super durable, waterproof and warm. We've been wearing them for years and they make for great hand-me-downs! Maileg Mouse - Twins in a Box Are you wondering why a toy is on my Clothes and Gear Guide? Well, these little mice are basically gear for my four-year-old. She never leaves home without them (literally) and they keep her occupied on the go. I think that qualifies as gear, right? Native Jefferson Shoe This is our other shoe of choice. My kids rock Natives from the first thaw until the first frost. They are completely waterproof, flexible and rubber-soled. They come in all colors and sizes. Some of these links are affiliate links. That means that I collect a small finders fee when you shop through my link. It does not cost you anything. Thank you for supporting The Workspace for Children by shopping my links. 1. Moluk Plui Rain Cloud Tub Toy The best bath toy EVER. It opens up, so there is no chance of the yucky stuff lingering inside, its easy on the eye in your bathroom, and interactive. Perfect for babies all the way up. My big kids can't stop using it. 2. Moluk Oogi Jr Fidget Toy: This is great for keeping little (and big) hands busy in highchairs, car windows, airplane tray tables, the bathtub, just about anywhere. It washes easily and is fun for all ages. 3. Kikkerland Solar-powered Rainbow Maker: They Stick up to the window and use natural light to project a rainbow. All three of my kids are getting one this year...Shhh! 4. The Original Toy Company Happy Pop Up Toy: This is my favorite thing to give to the toddlers in my life. It is a perfect toy for cause and effect, it is well made and so darn cute. 5. Sarah's Silks Enchanted Playsilk: This is great if you are new to the magic of playsilks. If you are hesitant to spend on the larger set (in part one), start with just one silk. It makes a beautiful dress, cape, tent, blanket, or anything else your child can imagine. 6. Hape Animals Wooden Memory Game: This beautiful set is well made and will be treasured for years. It will be making an appearance at our house this year. 7. OOLY, Color Appeel Crayon Sticks: These are as fun to use as they are to look at. They last forever and are very high quality. They make an invitation to play look very enticing. 8. Ostheimer Hedgehog, Cat, Bunny: I can’t decide which ones we are getting this year. I want them ALL! 9. 14 Piece Tegu Magnetic Wooden Block Set: These magnetic, wooden blocks are wonderful to work with. We have had one small set for a few years and I definitely plan to add to our collection. They are great on their own or can be used on a metal tray for a new experience. 10. OOLY Heart to Heart Stacking Crayons (comes with 2 sets): I love these keeping these in my bag for easy coloring at the doctor’s office or at a restaurant. They are adorable when you need a little gift or stocking stuffer. 11. Plus-Plus Tube Neon Mix (70 pcs. ): These are the perfect tube to stick in your glove compartment and bring in to restaurants to keep everyone’s hands working. The neon set is fantastic on the light table as well! 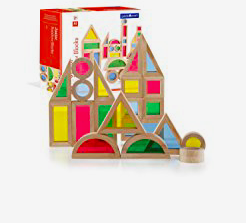 12.Grimm's Small (Mini) 6-Piece Rainbow Nesting Wooden Blocks Stacker: The mini-version of our all-time favorite. It is an instant classic. 13. Amber teething necklace: Both of my girls still wears theirs from when they were babies. The amber is both beautiful and functional. 14.Pustefix Bubbles: Did you have these when you were a kid? I did! This classic never goes out of style as a great stocking stuffer. These are THE BEST bubbles. Did you read PART ONE of our Holiday Shopping Guide? Click here to see it! There is one more installment coming soon. You don't want to miss it! Thank you for checking out my Gift Guides. They contain affiliate links which cost you nothing and give me a small finders fee. Thank you for supporting The Workspace for Children by shopping through my links. Sloane has never really been a big fan of Halloween. In fact, she’s only dressed up once in her four years. This year she has big plans of being a mouse, or so she says…. Do you have a child who is sensitive about Halloween? Maybe seeing the decorations feels scary? Maybe they feel unsure about putting on a costume themselves. I know that Halloween can be confusing for little ones. They are still figuring out the difference between real and pretend and Halloween can REALLY shake that up in them. Am I still me even if I am wearing a mask/wig/costume? Is that still my mom/ dad/ babysitter when she puts on a costume? WHY is everything so spooky and scary? Is it real? Are those kids playing dress up or is that really a monster/ skeleton/ ghost? I set up this little corner for Sloane to “practice” for Halloween. There are a few Halloween books, a few mini pumpkins in a trick or treat sack, a mirror and some simple masks and costumes. It gives her an opportunity to practice and process what we are learning about Halloween. 1. People are still themselves EVEN when they are wearing a costume. Talk A LOT about how people are still people, no matter what. Show this concept to your child by putting on a simple, NOT SCARY wig and say, "Look! I am still Mommy, even when I am wearing this silly wig." Show them over and over. Invite them to try it on themselves. When they've taken over, show them the mirror. "Look! You are still you, even with the silly wig on." You can make this more challening with masks and hats, etc. Answer the door and let them try saying, "trick or treat!" You can wear different disguises each time you answer if you want, remind them that you are STILL you! 3. Remind your Child that you will stay near them and keep them (incuding their feelings) safe around and on Halloween. Demonstrate by protecting them from tv shows or decorations that you know are too scary. Remind older siblings and well-meaning adults that Halloween can be too scary for some young children and to keep their tricks age-appropriate. Keep trick or treating short. Only take them to parties and parades that are age-appropriate. Most Importantly, HAVE FUN! Start some Halloween traditions that your family can enjoy year after year. Was this post helpful to you? If the answer is yes, please share it with other oarents of preschoolers who might benefit from it as well. Thank you all for reading and following along. Has Your Child Stopped Napping? Quiet Time Solved. Do your young children have down time? I mean REAL down time. Time to be bored, time to make up aimless games and stories? Do they have the opportunity to spend time alone? Truly alone, not alone with an iPad. Do they have quiet time carved out for them as part of the day? Mine do. And yours can too. You and your children deserve some down time. I am going to help you get it. I rely on this quiet, independent playtime everyday because I need it. I crave it. So do my kids. Without a little while each day to just sit still, I go all crazy and moody. And if I go crazy, my whole house turns into a zoo. A wild, untamed, unhappy zoo. It's no secret that I am not good at the constant go-go-go. It stresses me out and I become an impatient yeller. (My neighbors can vouch for this. They see me yelling and hustling children in and out the my car. ALL. THE. TIME.) For our family, the antidote to the crazy is taking a few moments of quiet time. Chilling out. Yes, you can teach your kids the art of chilling out. It takes commitment, consistency, and a little bit of creativity. We all need a break. I’m going to tell you how we carve out a break almost every day. I really believe all children can learn to have quiet time. I have heard many people talk about how their first-borns are too needy, or their boys too active. They worry that without a screen in front of them, or an adult to play with, their children cannot chill. They can. I promise. It will take some work on your end, but it's worth it. 2. You are playing, reading, creating, or sleeping. 3. Your time is self-directed. Of course, those guidelines look very different for a four year old, seven year old and ten year old. For Sloane, quiet time is often brief. About 35 to 40 minutes. It is usually spent in her room or in our little playroom/den. Lately, her activity of choice is playing babies, dollhouse, or blocks. Ruby loves art. So, quiet time for her is drawing, sewing, beading- any kind of making. Making is her gift. Quiet time-making happens in her room, therefore, it needs to be non-messy making. Her quiet time can last anywhere from twenty-five minutes to an hour. She gets lonely. Her personality demands she be part of a crowd. It's who she is. An hour of ‘alone’ is more than enough for her. Nate is airplane-obsessed. So, his quiet time almost always involves drawing and tracing airplanes. He wants to use the light table for tracing. The Light table is kept in our kitchen and his quiet time is set in his room, so the clever little guy set himself up a tracing station in his room. He tapes his work up to the sunny window and the light comes through. Perfect for his tracing habit. He also enjoys time with legos and magnatiles. His quiet time can run well over an hour when he has the luxury of time. Like I said earlier, I believe all children can enjoy some quiet time. I believe that all children NEED downtime, especially in our chaotic world. I know that it does not come easily to everyone. My oldest child is dreamy by nature. He beats to his own drum and has always been able to occupy himself. Even as a young toddler, he was happy with his cars and trucks and blocks for long periods of time. My middle child is not this way at all. When she gave up her nap (before two years old! ), I nearly lost my mind. She always wanted a playmate, was into everything and I could not deal. Her nap time was during her brother’s quiet time and my time to chill for a minute. There was no way I could give up those few moments of peace. So, I taught her how to be independent. Know That Quiet Time can be a Learned Skill....Believe it. Here's how we did it.... First, I made sure I really filled her up before quiet time. Ruby had lunch and her milk. More importantly, we read and played together. I gave her a period of undivided attention and labeled that time. We set the timer for 15 minutes and played together. No interuptions from the phone, her brother, the doorbell, etc. Barring an emergency, there was NO distraction. I promised her that. It was our “play together” time. In the early days, I would set out some simple invitations to play. A small blanket with a pretty bowl full of gems and a mirror for arranging them. Or a mat with a dollhouse and a few people and animals. A child-sized table with paper and colored pencils and stickers. You get the idea. If not, get on Instagram and plug in the hashtag #invitationtoplay. It’ll fuel you. Invitations should be open-ended. Your child should be able to take the material wherever his or her mind goes. To me, quiet time is a form of meditation. Meditation is an ongoing practice. Quiet time over here is always evolving, changing forms and continues to be ongoing. Sometimes we hit a rut and need to shake things up a bit. Sometimes, we have a few days where it just isn’t possible. On those days, I know I can expect more whining, fighting and general crankiness (from me and the kids). 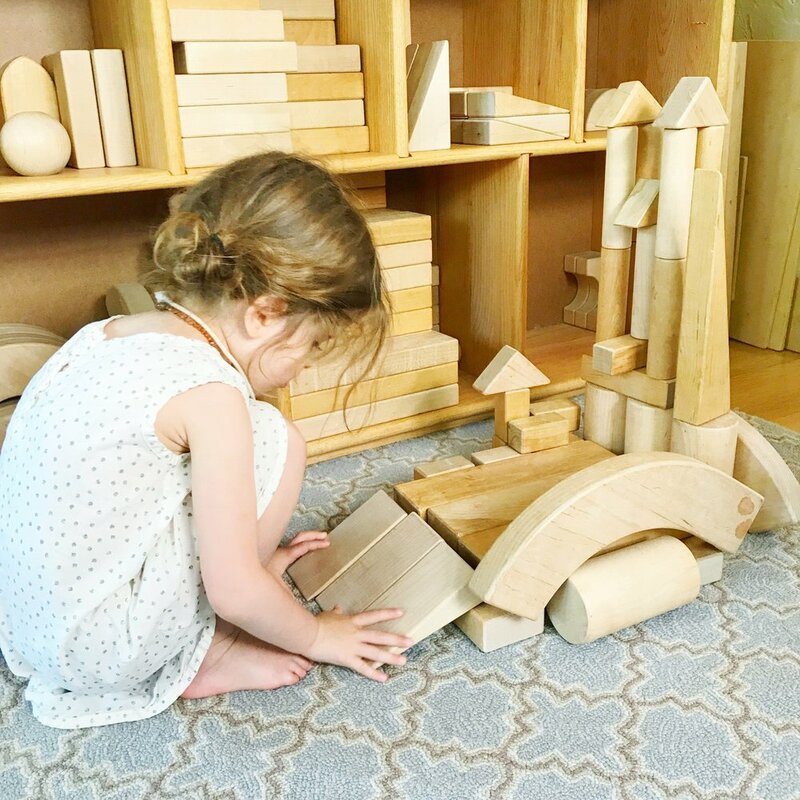 When we’ve hit a rut, I might mix things up by rotating toys, putting materials in an unexpected location, or setting up a more involved invitation to play. If it’s nice weather, one of the kids will have their quiet time outside on the deck in our tinker space. My oldest might choose the basement where his piano and his work bench live. It all depends on the day. I’ve learned to expect the unexpected and I try to be as flexible as I can. What if my Child Keeps Coming out of his Room? Keep walking them back. Just like the experts say when your child keeps coming down at bedtime. When Ruby was small, she wouldl test me by coming out of her room multiple times. Each time I would neutrally walk her back, reminding her that the timer didn't say it was time to come out yet. It was a bit trying at times, but TOTALLY WORTH IT. She learned the skill of quiettime through repetition and mastery. She learned to love quiettime when the routine was set, and it wasn't even a question anymore. At that point, she figured out how much fun she could have all on her own. One of the most important things I want to pass to my kids is the gift of being bored. I want them to be alone with their thoughts, to sit with themselves and contemplate. Insisting on quiet time is the gift I give to my family and to myself. There are tons of great articles on the benefits of quiet, independent play. I linked some here and here. You can also look on Instagram or Pinterest for inspirational invitations to play. However, keep it as simple as you can. You absolutely do not need to go out and buy anything new, nor do you need to spend more than 5 minutes setting it up. Lastly, remember this. It doesn’t matter how old your child is when you start having quiet time. Just start where you are. Expect it to be difficult at first. You can even introduce it by being honest…. “I want to teach you a new skill. It’s called independent play. This is how we will learn it…” When we take the time to explain what is happening, the response is often great. I would love to hear from you in the comments. Do you have a quiet time in your home? How do you make it happen? Did you find any of these tips helpful? Can you share some new ideas and tips to start the habit of quiet time?